I have not posted much here over the past year, focused on a rather consuming longer project. That project is on the right side of being done, and I am going to endeavor to breathe some fresh life into this forum. Being part of a group blog where most of the other participants have wandered off can be a weird undertaking at times, but solitary musing has its merits. This morning I was working on a segment of that longer project in which a group of contemporary American revolutionaries are holed up in a safe house in South Central. The setting was a house on Compton Creek, an urban waterway that feeds into the Los Angeles River. I have a fascination for urban rivers and streams, many of which are paved, or even buried under downtowns, morphed into invisible concrete veins of the weird ecological borg-nets that grow within the denser concentrations of human habitat. Those places tell us a lot about our relationship with our world. In the world of the story, the socio-political climate of American society has degenerated to a point where citizen militias sanctioned by fear-mongering government leaders patrol the streets in the name of homeland security. 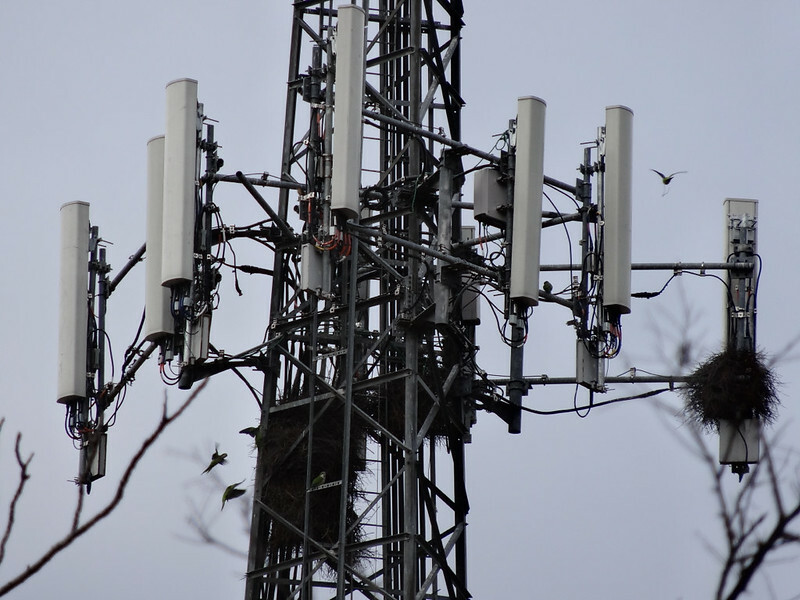 In some cases, they are even allowed to operate extraterritorially. So imagine my surprise when, exploring the network mirror of the real-world place of my fictional safehouse, where a pair of thieves turned social bandits turned revolutionaries are hiding from the vigilante militias, I turned on Street View and found a picture of a cowboy, on horseback, checking his Blackberry. We got your posse right here. It was a weird thing, as if my objectively fantastic narrative were infiltrating my reality. Or, more accurately, the weirdness of reality was wriggling its way into my story. So I went for a walk, down the street to a very similar urban waterway in my own neighborhood in Austin. Past the birdhouse facsimiles of the great buildings of the world, real and imaginary, through the empty lots where people forage for fallen pecans under the old trees, past the cell tower that has been condo-ized by the multi-family nests of monk parakeets descended from escaped pets of the 1960s, past the ruins of the old Exxon tank farm and the beautifully tagged abandoned freight cars, down Jain Lane, through the woods where drifters camp in the dense understory between the freeway, the railroad tracks, and the creek. 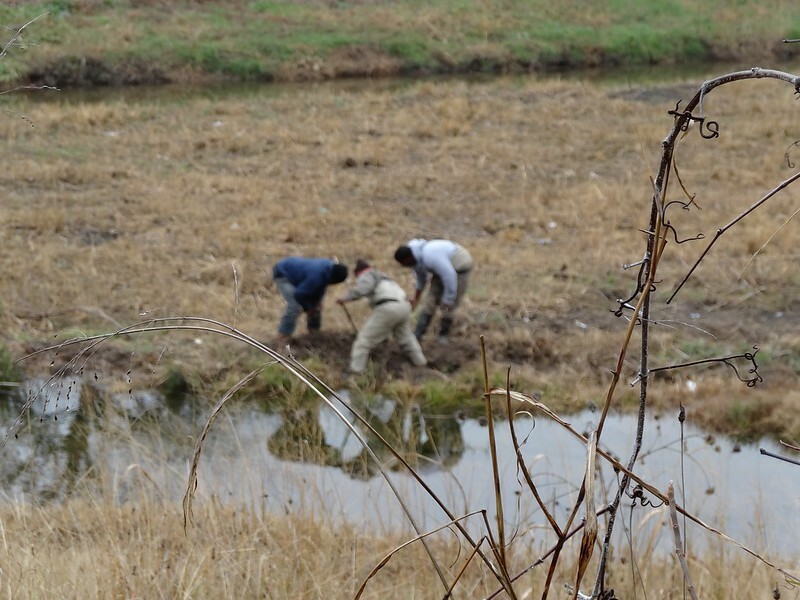 The creek where people dump their old tires, and this morning a trio of urban fisherman were harvesting nightcrawlers from the muck that follows a much-needed three-day rain. A few weeks back on this same walk, I found a curious object lying in the grass between sidewalk and curb. 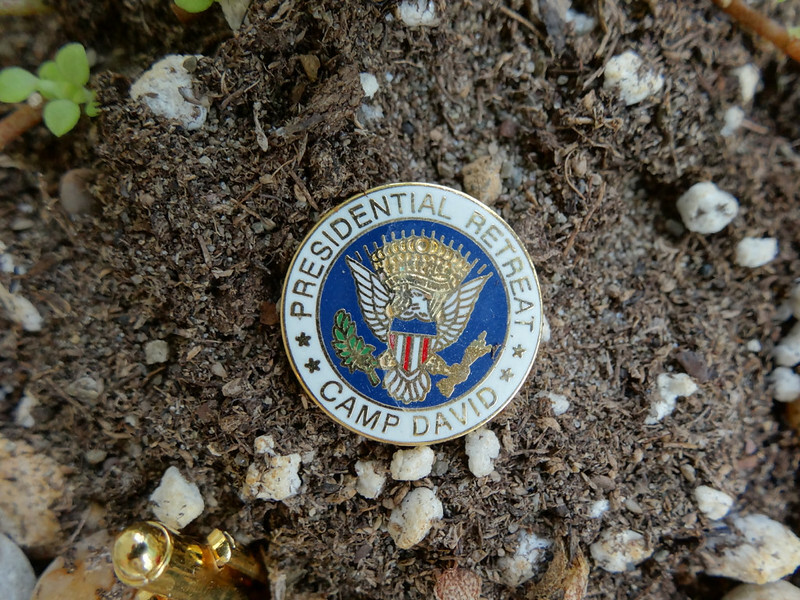 A single cufflink embossed with the federal eagle and the words "PRESIDENTIAL RETREAT—CAMP DAVID." This struck me as an unlikely thing to find anywhere, let alone at the edge of an industrial neighborhood across the street from a burned-down puteria and next door to an oil truck corral. 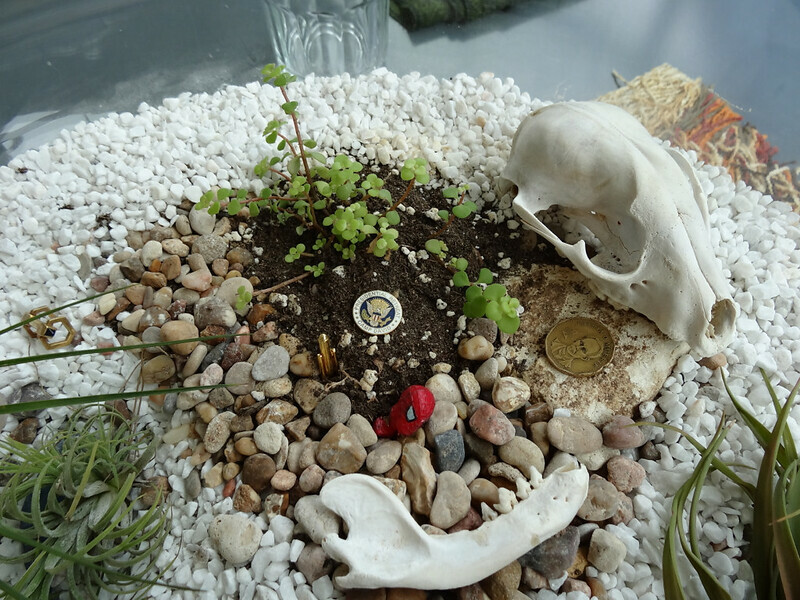 The cufflink ended up in my pocket, a semiotic pecan harvested for addition to one of the terrariums we have created to curate the tangible mindscape of life here in the inter zonas of the American edgeland [see pic at top of page]. Over the holidays, one of my neighbors, a wise veteran of several decades of wars of mental liberation who has lived in these parts for a lot longer than me, asked me where I had found the cufflink and told me how the now-abandoned class B office building that the sidewalk in question passed by was once, he believes, a secret government facility. 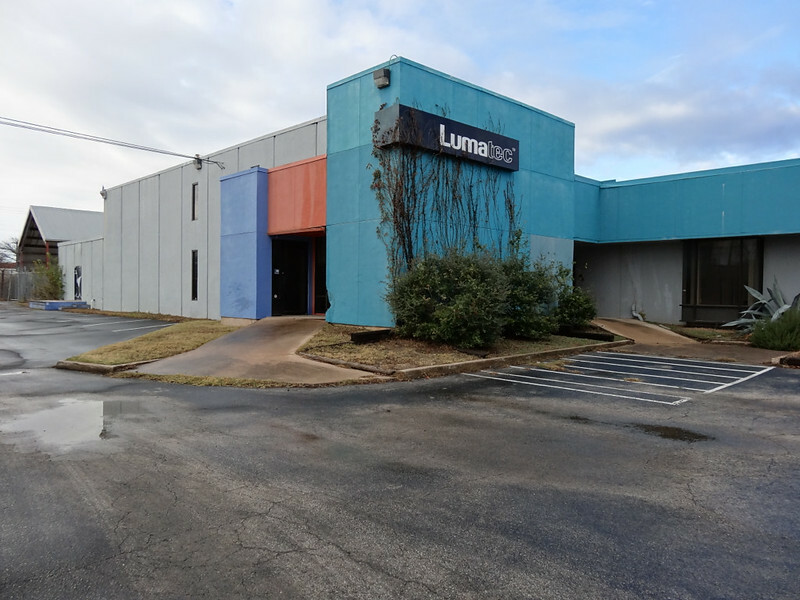 He explained how, in the strange period of our recent past when a Texan was President, that little office building was always host to an array of black SUVs and sedans with tinted windows and government plates. He figured it for CIA, after researching the company with its name on the door and finding they had offices in places like Karachi and Dubai. Or maybe it was just Secret Service, keeping a stable of vehicles in one of the places the President regularly visited—his sometime hometown. It's an outlaw skatepark now. But, like anyplace, if you look closely enough, the secret agents may have left behind clues. Encrypted sigils, encoding Easter eggs for you to reimagine the world in which you live.